Following the cessation of operations at Lomada de Leiva in November 2017, Patagonia Gold currently has one operating asset – Cap-Oeste, which began production at the end of 2016. Production at Lomada, totalled 93,246 oz over its 4 year life and LOM (Life of Mine) production at Cap-Oeste is currently forecast to be 88,502 oz AuEq. 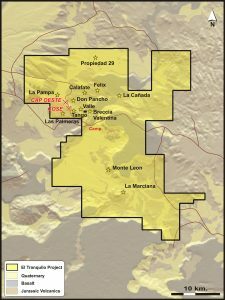 The Cap-Oeste Project is located within a structural corridor extending six kilometres from the La Pampa prospect in the northwest to the Tango prospect in the southeast. To date, the Cap-Oeste deposit has an identified and delineated strike extent of 1.2 kilometres. The latest JORC compliant resource estimate completed by CUBE Consulting Pty Ltd (based in Perth, Australia) reports current Measured and Indicated Resources of 12.5Mt @ 2.76 g/t Au and 50.14 g/t Ag for a contained 880,000 oz gold and 24.3m oz silver with Inferred category material of 4.89Mt @ 1.37 g/t Au and 34.74 g/t Ag for a contained 215,000 oz gold and 5.5Moz silver. Development of the Cap-Oeste asset was completed in July 2017 with the construction of a hybrid low cost version of the heap leach facility design produced for the PFS and was completed on time and within budget. Stacking and crushing stages were removed along with the Merrill Crowe circuit and a standard carbon in column plant constructed. With mining having ceased at Lomada, the fleet was transferred and is now on site at Cap-Oeste, along with the addition of four new CAT mining units which have more than doubled the fleet capacity and are now fully commissioned and operational. 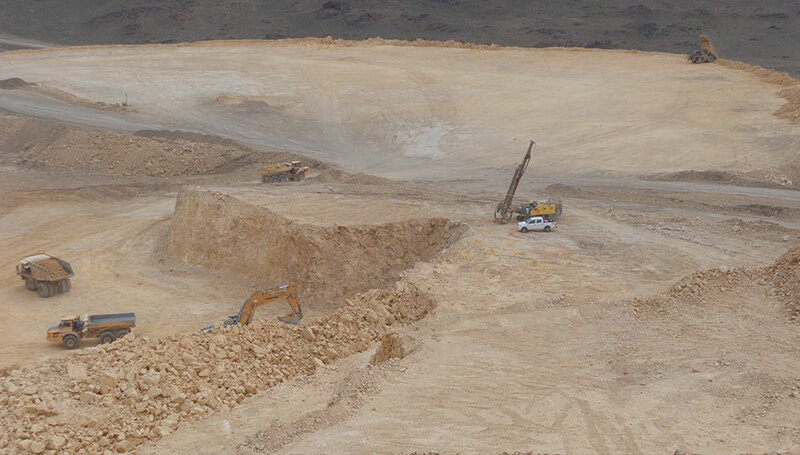 In Q3 2016, it was discovered that a high clay content in the upper sections of the Cap-Oeste orebody was affecting the percolation of the leaching solution and adversely impacting gold and silver recoveries. As a result, the Company took the decision to install an agglomeration circuit in order to improve recovery rates from the Cap-Oeste ore. Final commissioning and testing of the circuit successfully took place during July and August 2017 and the heap leach pad is now producing from a fully commissioned agglomeration plant with the recovery issues having been resolved. The existing pad capacity has been expanded to accommodate the newly agglomerated ore and to make available additional areas to re-handle and agglomerate the 800,000 tonnes of ore already loaded onto the existing pad. The average daily production of agglomerated material is approximately 3,000 tonnes per day. The agglomeration circuit is currently being fed with ROM (Run of Mine) ore and once stabilised, material from the existing pad will start to be processed. The agglomeration circuit has a nameplate capacity of 500 tonnes per hour and will be operated on a one shift per day basis. Current pit operations have now advanced to a level where high grade COSE-style hypogene mineralisation has been exposed enabling the Company to confirm the shoot’s dimensions, style of mineralisation and grade below the current pit. A subsequent reinterpretation of the deeper drilling and mineralisation intersected below the current pit has led to a material increase in the tonnage and contained gold and silver of this non-refractory style of mineralisation (which falls within the COSE-style mineralisation). An updated JORC compliant resource model has been completed by CUBE Consulting to report on the ore below the current pit and shows a material increase in the COSE-type mineralisation within the Cap-Oeste Measured and Indicated Resource of approximately 295,000 oz AuEq at an average grade of 19.40 g/t AuEq. This ore can be treated by cyanide leaching. Alternatives to extract value from this high grade deposit are being reviewed.